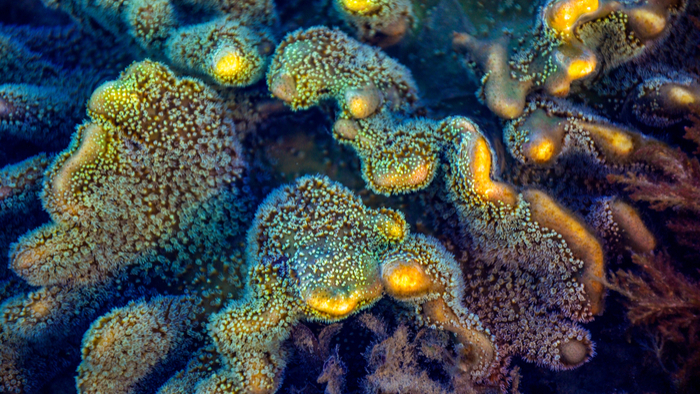 • Pacific Standard discusses new research showing some parts of the world, coral communities are growing and in fact taking over other species habitats. • What can philanthropists and conservationists do with information like this? How will the effect food systems in Japan and the Mediterranean? • Here’s an article showing the negative effects of climate warming for our planet’s coral. Ocean temperatures have risen an average of 0.13 degrees Fahrenheit per decade, threatening many of the world’s coral reefs. Mass bleaching events—caused when corals become thermally stressed and expel the symbiotic algae that give corals their vibrant colors—are becoming more frequent and more severe. A 2016 bleaching event, for example, damaged 94 percent of the coral on the Great Barrier Reef. New research, however, indicates that not all hope is lost for the world’s corals. Researchers found that, in some spots, like off the coast of Japan and in the Mediterranean Sea, corals can overtake other species, including seaweed, to establish new habitats. But, at what cost? Previous research predicted that rising ocean temperatures due to climate change would cause a shift from corals to seaweed in coastal ecosystems. As corals degrade from disturbances such as mass bleaching events, seaweed can enter the habitat and use coral skeletons as substrate to live on. But recent fieldwork suggests that the opposite may be happening: some coastal habitats are beginning to shift from seaweed to corals. Interested in learning more about Animal Welfare? Other readers at Giving Compass found the following articles helpful for impact giving related to Animal Welfare. If you are looking for opportunities to learn and connect with others interested in the topic of Animal Welfare, take a look at these events, galas, conferences and volunteering opportunities aggregated by Giving Compass. In addition to learning and connecting with others, taking action is a key step towards becoming an impact giver. If you are interested in giving with impact for Animal Welfare take a look at these Giving Funds, Charitable Organizations or Projects.